Madrid is one of Europe’s greenest and most beautiful capitals. Amongst gardens and artworks, eco-friendly accommodation and farmers market, there’s plenty of reasons to go and visit it. Madrid can make you forget city’s chaos and send you in another dimension, made of nature and tranquility. Do you not believe us? Make a trip there, then! Madrid is everything that you can desire from a big European capital: art, history, sport, free time, food and a lot of greenery. The city offers more than 250.000 hectares of green areas where you can try different activities or just relax. Moreover, you have the chance to make a boat ride or to look over the landscapes form the cable car. If you are planning a holiday in a wonderful European capital, but you have not decided which one yet, here’s 10 good reasons to visit Madrid! To get to know the charm, the history, the art and the culture of a city like Madrid, you cannot pass up a tour in one of its many museums. 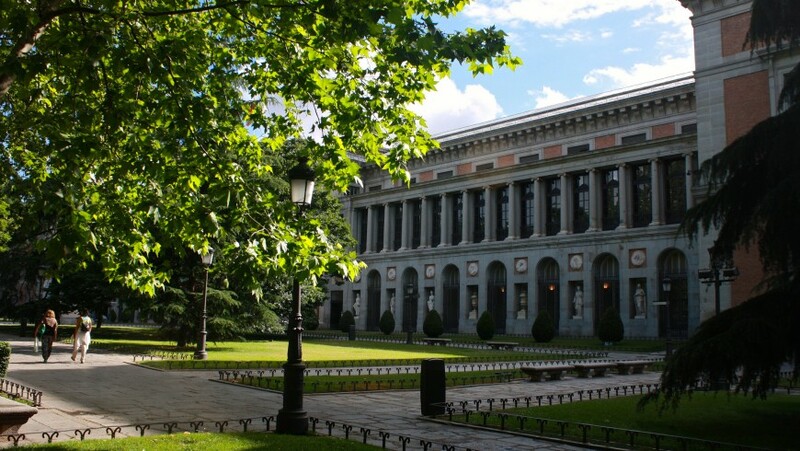 In the Spanish capital, there are more than 40 museums: The most visited are El Prado Museum, the Reina Sofia National Museum and the Thyssen-Bornemisza. The museums of Madrid keep some universal masterpieces of artists like Goya, Picasso, Velasquez, Dalí (just to name some). Most likely, you will need more than one day to admire all the art kept in the city. Anyway, it will be enough to enter in one of the museums to feel the echo of centuries of history. Generally, you have to pay an entrance ticket, but if you go there just two hours before closure time, it’s free! In Spain, markets as social gathering or touristic attraction places are always more common. In Madrid, there is a wide range of choices. There is the biggest Sunday market of the world, the flea market El Rastro, and a vast number of food markets that are characterized by their style and the variety of delicacies. 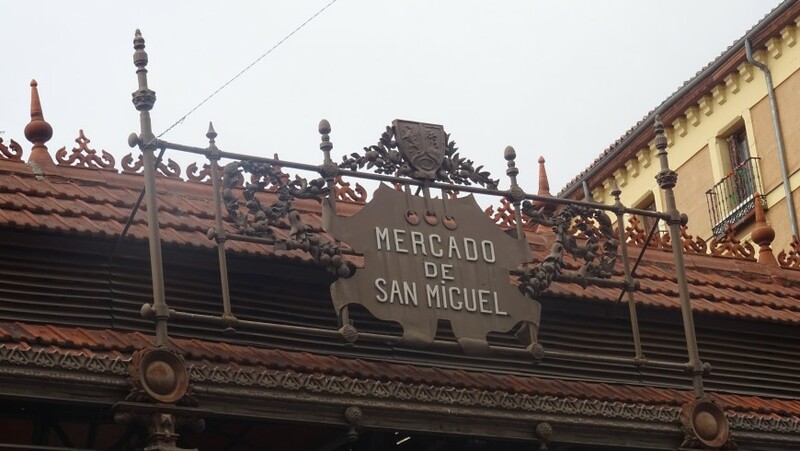 Amongst the most elegant and visited, stands out San Miguel Market. Here, you can find an incredible quantity of cooking specialties, also quite refined. It is definitely worth a trip also Anton Martín Market, which offers biological and international restaurants, and San Fernando Market, in which every Sunday there are salsa lessons. The Park of the West (Parque del Oeste) is a true relaxing park. 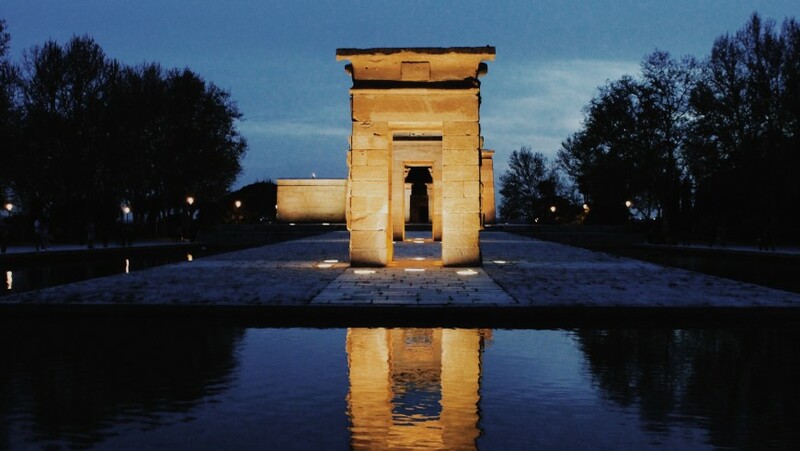 This beautiful park is near the Manzanares River and inside hosts the Debod Temple, an authentic Egyptian temple, and the walking path dedicated to Rosales, the painter. Before the night falls, this place turns into a magical terrace over the park, from where you can marvel at the most beautiful sunsets of the city. During the day, you can spot in the park many birds species, in particular, you can see many bright green parrots. 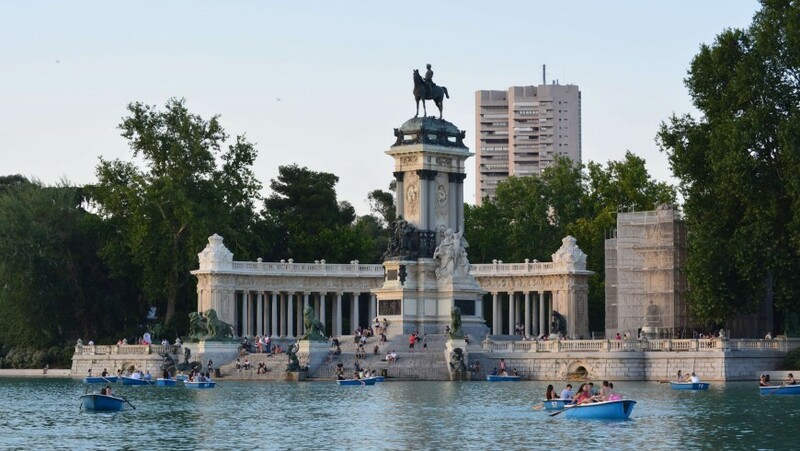 The Buen Retiro Park is one of the most visited by the inhabitants of Madrid. Mostly in sunny days. Here, you can try many open-air activities, such as walks, sports or even rowboat rides. Just in front of the monument dedicated to Alfonso XII, there is a small lake full of fishes and navigable. Those who don’t want to row must not worry: the lake is navigable also with a special silent and ecological boat, fueled through solar panels. After all, every Spanish park is worth a visit. Very close to Buen Retiro Park, there is the fascinating Madrid’s Botanic Garden. Inside, you can find more than 30.000 different plants from all over the world. Venturing in this “forest”, you can find many aromatic and medicinal plants, roses of every color and shade and even secular trees, such as a giant sequoia. 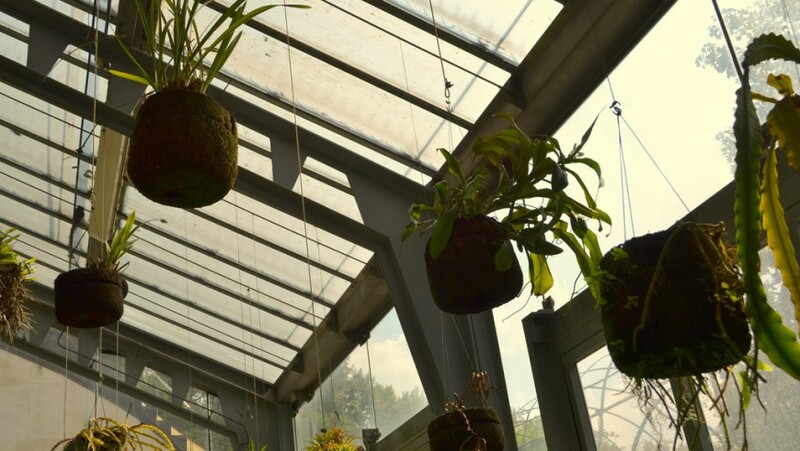 Inside the greenhouses, you can see plants and trees from temperate, tropical and desert climate areas. The entrance fee is about 4 euros. 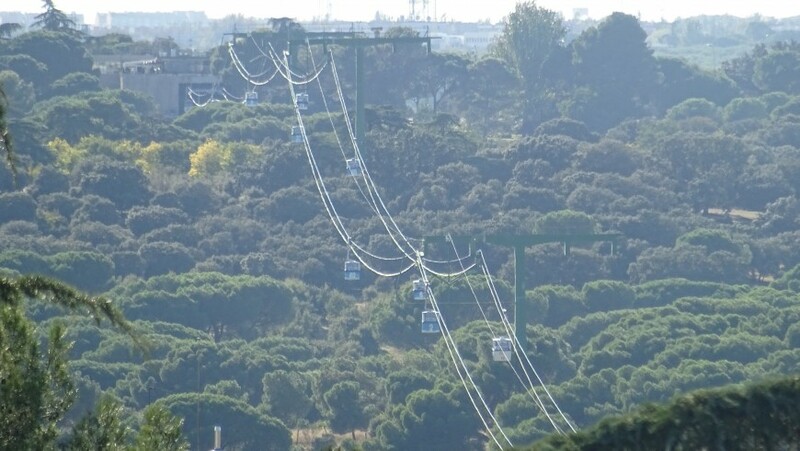 The cable car of Madrid, known as teleférico, is located in the suburbs of the Spanish capital. This 100% ecological means of transport gives the thrill and the pleasure of discover the city from above. The adventure begins from Paseo del Pintor Rosales and ends at Casa de Campo. You can admire many beautiful landscapes along this extraordinary path: the Park of the West’s rose garden, the train station of Príncipe Pío, the church of San Antonio de la Florida, the Manzanares River and the square of los Pasos Perdidos of the Casa de Campo. Both at the beginning and the end of the park, there are bars and restaurants. Barrio de las Letras, in English “Neighborhood of Literature”, takes its name from the Golden Century of Spanish Literature, when the most important writer lived in the city. Located between Calle Atocha, Paseo del Prado, Carrera de San Jeronimo and Calle Cruz, the most particular feature of this neighborhood is in the streets. 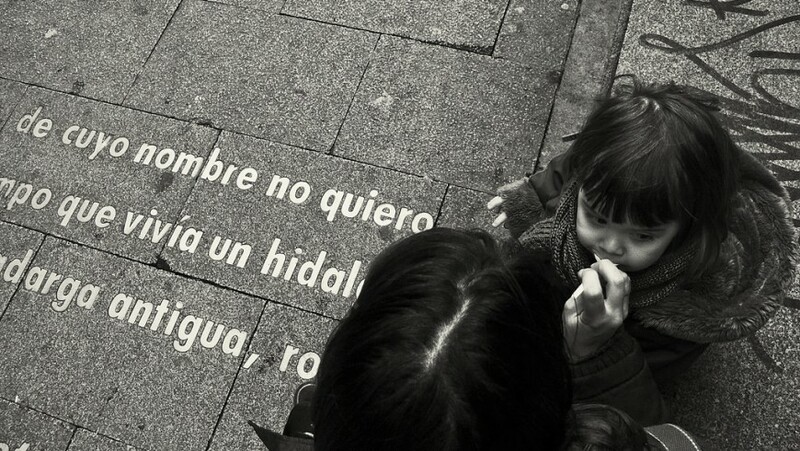 On the pavements, you can find many golden writings quoting famous Spanish writers. All around there are squares and picturesque historical palaces. 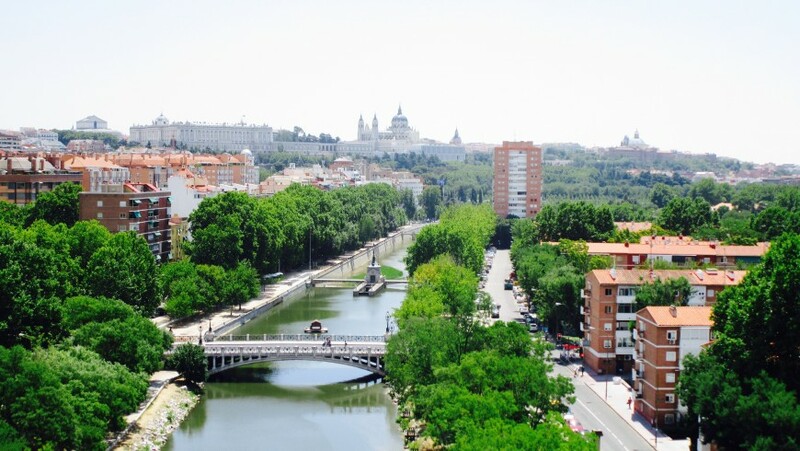 Manzanares River crosses the capital, flowing also inside Casa de Campo, the largest urban park in Madrid and Europe. Once, it was a private forest and the king’s hunting reserve, today, it’s the perfect place for bike-lovers. The one near the Manzanares is tourists and inhabitants’ favorite biking path. During the relaxing ride, you can spot many trees and attractions, such as 12 stunning ornamental fountains. Those who want to discover the history and all the paths of these places, can book guided tours easily from the website. You can move around Madrid in many eco-friendly ways: The city administration focuses on the protection of its citizens’ health. 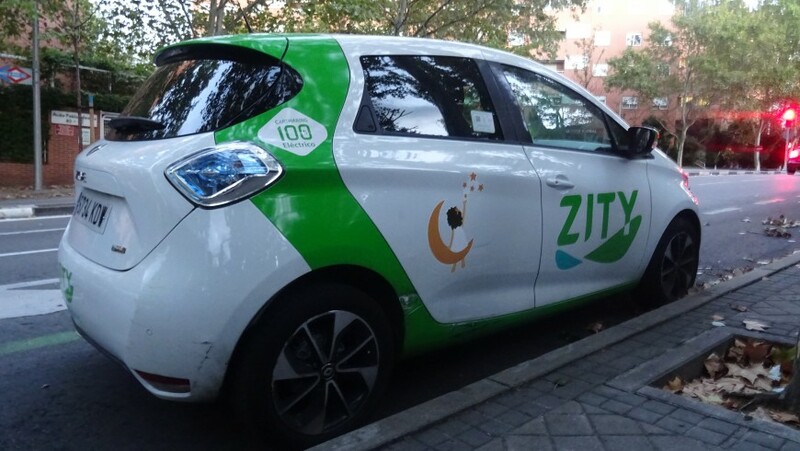 Since January 1st, 2018, for example, all the new taxis must be ecological, electric or hybrid. That is not the only new measure. Citizens can already benefit from the various car and scooter sharing spread around the city. Every means of these points is 100% ecological. Moreover, those who don’t want to tire too much while visiting the center’s streets, can always rent electric bikes and also kick scooters. A true green revolution in the city’s mobility that improves the air quality. Madrid offers various culinary delicacies and it’s not difficult to find cheap restaurants. In every corner of the city, you have the chance of tasting many typical dishes: fish or vegetables empanadas, cocido madrileño, tapas, squid bocadillos, gazpacho andaluso and many more! 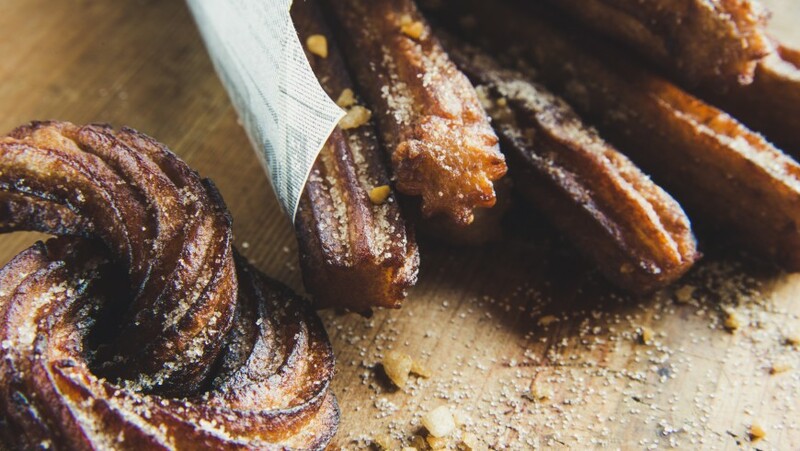 To those who don’t want to miss a delicious sweet breakfast, we suggest to try the famous churros with a cup of hot melted chocolate. In the end, it’s not difficult to sleep eco-friendly in Madrid. In the Spanish capital, there are some eco-friendly hotels: From design hostels focused on sustainability, to flats built according to the principles of bio-architecture, which reduce water and energy use and waste. Do you think a trip to Madrid will be worth it? This entry was posted in go green, journeys and tagged Botanic Garden, Casa de Campo, cuisine, El Prado Museum, Europe, green city, green travels, Madrid, Manzanares, Mercado San Fernando, Mercado San Miguel, museums, nature, Parks, Parque del Oeste, Parque del Retiro, Spain. Bookmark the permalink.